Watched Over The Hedge with the kids, which was entertaining enough. Now, I'm playing DJ at the computer while they go for the pillows. Kids like me to sit at my desk and spin music when they drift off. It's easy to do, my office is downstairs in the middle. The kid's rooms are on each side. Old Doobies, from The Captain & Me. 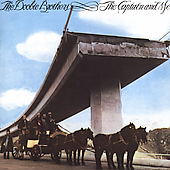 The album cover art shows the Doobs under the fallen freeway overpasses in Sylmar a lifetime ago. Same ones that fell down again during the Northridge Quake because the government built it to exactly the same standards as the one that fell down in 1971. Duh. You know the pre Michael McDonald stuff was the best. After he came, it was just disco. Can't figure out where all the gunfire is coming from though. Thought it was illegal fireworks at first. Stopped now, or I can't hear it over Dark Eyed Cajun Woman. Something like that. Forgot how good those guys were. On to the Flying Burrito Brothers and Six Days On The Road. Ought to have a contest to see whose version is the best. Might be that one. Could be Sawyer Brown's though. Still can't quite believe they played Boingo's Dead Man's Party at Wayne's funeral. Okay, you had to listen hard, it was right there, quietly at the edge of din of voices afterward. And it was his request. On to Gwen Stefani and that Oz sweetie. Natalie. I hate it when the new stuff is old. T For Texas. Saw Skynard do a concert in the 1970's on BBC the other night. Dude, Billy Powell was thin. Guess we all were. Mighta shoulda hooked up with Rick in Paso for the weekend. If he took notes, I'll have him guest blog.